What is the best fibre for carpet wool, nylon or the new eco carpets? There is nothing nicer than a good wool carpet, but sometimes other fibres can be more appropriate depending on your environment, lifestyle or personal preferences. Wool is a natural fibre and a good insulator; it tends to age a bit better than nylon and maintain an attractive appearance. That said, nylon and eco carpets tend to be easier to remove many stains from, an advantage for young families and pet owners. Choosing the right carpet is dependent on what you like and of course the colour. The best way to decide is to visit our Eastwood (or Auburn) showroom. Here you can see and feel the carpet, and borrow samples to see in different lights inside your home. Carpet never looks the same in your home as it does in our showroom. What is the difference between a square metre of carpet and a lineal metre? Floor carpet prices are generally based on a lineal metre, or a metre off the roll. A roll of carpet is 3.66 metres wide (a few are 4 metres). If the carpet price is given as a price per square metre, multiplying this by 3.66 will give the lineal metre price. 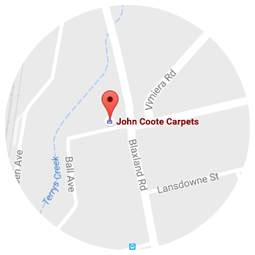 Yes, John Coote Carpets supply and install carpet all over Sydney, and often further afield. Our installers have all worked with us for many years. Installation can include take-up and disposal of the existing floor covering and moving of furniture if required. How long does it take to install carpet? Most installations are completed in one day, even a large home. Once we do a free measure and quote or see your plan we will be in a better position to advise a more exact time frame. John Coote Carpets supplies all types of underlays foams, rubbers and felt underlays. For domestic use we primarily use Airstep foam products. You can try the different underlays under the carpet you select to see how they feel. Our sales consultants are able to help you ion deciding the right underlay for your carpet. The height of the doors in your home may also be a factor in selecting an underlay. If you choose a very thick carpet and a dense underlay doors may need to be shaved. We can link you up with trades people that can do this. It is recommended that you change the old underlay when you change your carpet. Carpet manufacturers will not guarantee their carpets if laid on old underlay (except in rare instances). A floating floor is a click together floor that is not attached to the actual floor underneath . They are installed a little out from the wall to allow for expansion and contraction, on an underlay anything from 2mm to 8mm in height depending on the acoustic requirements of the property. At John Coote Carpets we have a range of timber varieties to select form natural timbers in a range of species, and many Oaks. We also supply and install bamboo flooring and have on display many good quality, less expensive laminates. Are floating floors hard to maintain? Floating floors are all prefinished. They require no sealing or polishing. To clean a floating floor you use MIMIMAL water. Do we install floating floors? Yes we do. It may be possible for you to do it yourself if a small area, but you will have a much better result if laid by professionals. It is important to note that the quality of the job also depends on the floor surface underneath. If the floor is concrete more often than not some floor levelling is required. This is an additional charge that will be costed once the old floor covering is removed. How expensive is a floating floor? Timber and laminate floors are costed on a square metre basis. They will usually be more expensive than carpet, especially if floor levelling is required. A laminate will be less expensive than timber. We do obligation free measure and quotes and give price options, or can quote directly from your plan if you have selected a product. Do people still use vinyl flooring? Yes, vinyl flooring is still extremely popular, especially in high traffic, hard wearing areas such as kitchens, laundries, dining and family rooms. Vinyl is a cost effective option where a hard wearing floor covering is required. You can achieve the tile or timber look on your floor without the cost of installing a floating floor. Our professional time work closely with you to ensure you do not have too much waste. With vinyl it is extremely important to have professional installation. The floor surface underneath must be perfect for the product to be guaranteed. Our installers will level and smooth the surface if necessary. Provide over the phone advice on floor coverings and provide a price "guesstimate".